We have seen the wrath of typhoon Yolanda (Haiyan). The devastation it caused has affected not only a few cities and houses in the Philippines but the majority of the Visayas region where the death counts has now reached thousands and number of families affected now millions. A conscious effort is now spearheaded by the Davao Bloggers Society and Filipino Bloggers Forum to join the relief operations by raising a total of P100,000.00 to finance and produce 1,000 hygiene packs for the victims. Each kit which amounts to PHP100 or USD2.50 will contain toiletries and other essential goods for a week's use of one person. 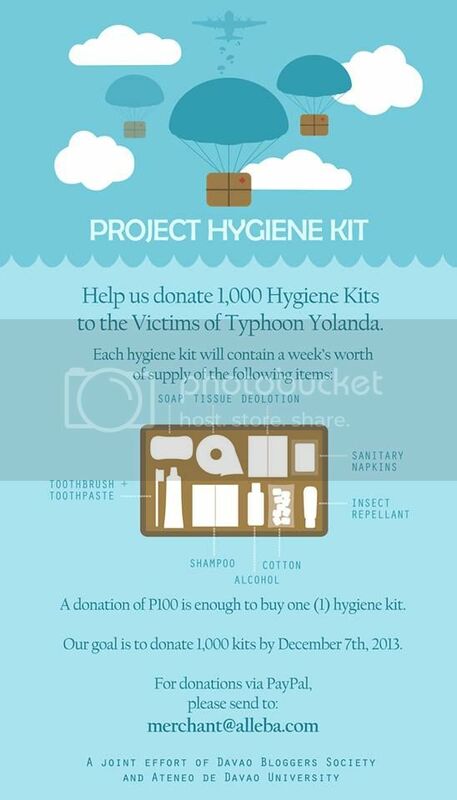 Hygiene kits were chosen to be donated as this is something that is not yet prioritized by many donors.